Lincoln has introduced a new line of Dual-inlet, Air-operated, Double-diaphragm (AODD) Pumps for continuous use in heavy-duty vehicle service and industrial applications. Originally developed for antifreeze/water mixtures, the pumps dispense other light fluids compatible with Buna-N, aluminum and/or polypropylene. The AODD Pumps feature dual inlets to mix and dispense two fluid products in a 50:50 ratio. 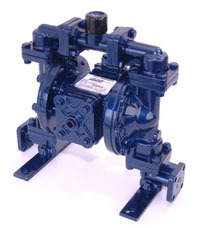 Available in ½-inch and 1-inch sizes, the pumps can meet the volume needs of many specific applications. Lincoln has introduced two new diaphragm pumps ideal for light fluid transfer applications in industrial and automotive as well as construction and mining environments.